Providing fast, reliable emergency service and quality restoration for all property owners. Are you facing a water emergency at home? This could happen due to a number of reasons. You might face a pipe breakage or experience a sudden clogging of your sewage system. And if you live in a flood-prone zone, you might also experience standing water from the flood in your house. In such a scenario, it is advisable that you hire a professional company for the water removal. We, at A-emergency, can be a good choice for you. We are an experienced and reliable company with a team of dedicated experts who can help you out with the water removal. We have been in this business for more than 10 years and are aware of the serious challenges this kind of emergency can pose for you. We are available for 24 hours and 7 days. So, if you are from areas such as Arlington Heights, Chicago, Des Plaines, Evanston, Glenview, or Mt Prospect, then you can resort to us. Here, we have enlisted a few crucial ways standing water in your house can affect you. Take a look. Standing water consumes all the aspects of the house including the electric circuit. This could lead to electrocution and lead to fatal accidents. If you want to protect yourself from such situations, you should go to a water removal service. Another important risk that you will be exposed to is mold damage. Moisture and dampness from the standing water can breed molds and mildew which can be hidden even in the most obscure parts of the house, making it difficult to detect. Therefore, it is essential to get rid of the standing water immediately. Lastly, you should understand that the standing water damages the foundation of the house and destroys all your belongings too. It is a great loss and a major source of inconvenience. So, if you want to hire us to remove your standing water, get in touch with us now. Water damage occurs regularly and the best way to minimize damage and loss is through effective water removal. It is important to act fast when you see signs of flooding. If you need water removal or water damage restoration in Chicago, Niles, Morton Grove, Skokie or Lincolnwood then you should contact a disaster recovery company such as A Emergency. They provide disaster recovery services including water removal and water damage restoration. Flooding not only causes damage but disrupts your daily life. It is a situation you need to deal with quickly and effectively. 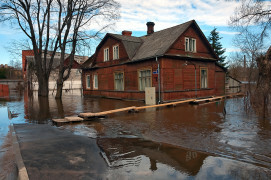 Depending on the scope of the flooding and the nature of the damage a disaster recovery team will put together a plan of action to effectively remove water from your home and to perform required repairs. In some cases it may be necessary to protect and secure your property with board ups, tarps and other temporary measures. Effective water removal requires the right equipment such as powerful pumps, extractors and humidifiers. It is important to remove all the water and to dry and disinfect affected surfaces and areas. Water from a contaminated source needs to be dealt with as quickly as possible in order to prevent health problems. Even water from a clean source and soon become contaminated. If your flooding resulted from a domestic source it is important to fix the problem in order to avoid a recurrence in the future. A professional disaster recovery team will also inspect your property for mold and they will perform mold remediation if necessary. Once the water has been removed and everything has been cleaned, dried and disinfected the water damage restoration work will be done. This way your home will be repaired to pre-disaster state and you will be able to get back to your normal life. With water damage, how prompt can a response team get to the scene has a drastic effect on the water damage. Leaving floors or walls to dry on its own for more than 72 hours contributes to mold growth. Here, we do take on pride ourselves on having the fastest response team for providing reliable emergency service and quality restoration for all residential and commercial property owners. We have the team you need to limit water damage and repair any damage it has already caused. So, contact us now in this number 250- 862-3500 and our water restoration team will reach your home in no time to stop the damage before it turns into something much worse. Proper water restoration is no easy fixation. You do not merely tighten up a few water pipes before leaving for your office. At A-Emergency Services & Restoration, our water damage restoration specialists do take pride in wholly restoring any property, be it residential or commercial, taking no short cuts and leaving every customer of ours satisfied. Right from the first step to the last, we ensure that we do the complete job you expect from our water restoration team. When your home is affected by water damage or flooding, you need quick action measures to be taken in order to save it from further damage. The bottom line is, your property is now in a vulnerable state and it needs immediate water removal. But before you rush to hire a water removal company, there are a few questions to ask yourself in order to make sure that you are going to get the best services, best results, at affordable prices. Is the water damage clean up company an accredited business? Working with a water removal accredited business means that you, as a client, will be offered water removal services that meet accreditation standards. If you want to hire such a company in Chicago, Lincolnwood, Morton Grove, Niles, Skokie then make sure they’re accredited. It is the best guarantee that your property will go through a proper clean-up process. Can you use your home insurance to benefit from the services of a water removal company? You will have to discuss this matter with your insurance agency. Only your insurance agent can tell you if you can benefit from water removal services that are covered by your home or property insurance. The water removal company can help you determine which objects are salvageable and which are not, thus giving you and the insurance company an idea of the cost of the losses. For example, many water removal projects begin with getting rid of sofas, mattresses, or cloth households; they need a lot of time to dry and usually grow mold and a bad smell, so you can consider them lost. Does the water removal company have specialized equipment? Water removal equipment is vital in this industry; working with modern tools in order to eliminate water from a property ensures a quick damage recovery process. Timely home restoration after water damage is crucial: if you act fast you can save more household items, get better cleaning results, and eliminate unpleasant odors. A-Emergency Services & Restoration offers priority disaster recovery services like smoke damage restoration & water removal in Lincolnwood, Skokie, Chicago, Morton Grove and Niles. The usual saying is where there is smoke there is fire. When it comes to smoke damage restoration and water removal in Lincolnwood, we can change the emphasis and say where there is fire there is smoke. Smoke damage can also vary depending on the type of fire. One thing is clear and that is you want to get rid of smoke in your home as quickly as possible. A-Emergency Restoration Services provides disaster recovery services like smoke damage restoration and emergency water removal 24/7 in Chicago, Niles, Morton Grove, Skokie and Lincolnwood and part of these services include smoke damage restoration and water removal. The flames and heat of a fire will usually cause severe damage but smoke can also result in considerable damage. Smoke can stain and penetrate materials resulting in discoloration. Wet smoke will also leave a sticky residue on floors and surfaces that can also cause further damage. Most types of smoke, be it wet smoke, dry smoke or protein smoke, will also leave behind a pungent and unpleasant odor. Part of the smoke damage restoration process involves smoke removal, odor removal, cleaning and salvaging. Smoke and soot needs to be cleaned from surfaces and odors need to be extracted and neutralized. The disaster recovery team in Lincolnwood uses special materials and equipment to mitigate smoke, remove stains and neutralizes odors. Water damage is another potential cause of severe property damage. If water accumulates inside your home you will need to act fast to get rid of it. Water removal may require the use of specialized equipment such as pumps, humidifiers, fans and commercial cleaners and disinfectants. You do not want accumulated water to stand. Standing water will seep into materials, furniture, appliances and foundations and this can result in substantial damage. Water from a contaminated source will also pose an immediate health risk. Standing water can become contaminated and will also promote the formation of mold. Water removal needs be done as soon as possible in order to prevent additional damage and to avoid health risks and we are the experts at water removal in Skokie, Morton Grove, Lincolnwood and the Chicago surrounding areas. One of the main reasons for water removal in Morton Grove comes from having some form of water damage you can have many possible sources such as floods, burst pipes, problems with your plumbing system, faulty appliances, overflows, leaking roof and so on. When excess water accumulates where it should not you fast water removal. If you suffer serious damage you will need to call in the water damage cleanup experts. You should also know where the water shut-off is located in case of a serious domestic water problem. Household problems such as faulty plumbing and overflows can result in considerable water damage. These problems might not be easy to detect until after the event. A Emergency provides fire damage clean up in Chicago, Niles, Morton Grove, Skokie and Lincolnwood and can assist you with water removal and clean-up. If water is allowed to stand for too long then mold will set-in and grow. Apart from mold, water itself can reap havoc on, carpets, furniture and appliances. Water can also compromise the structure of your home, wood can rot and fabrics can be destroyed. Apart from damage, untreated excess water will soon pose a health threat. If the water is from a contaminated source you will face immediate health risks when dealing with water removal in morton grove. Excess water needs to be removed quickly and effectively to prevent greater damage and to avoid health problems. The process of water removal and water damage clean-up can be complex and should be left to the experts. They have special equipment and wear protective gear to shield them from toxic fumes and contaminated water and contents. Water removal in morton grove can involve water extraction, drying, salvaging, decontamination, sanitization, sewage removal, mold remediation and dehumidification. In addition a disaster recovery team will identify the source of the problem and correct the issue or advise you regarding the steps you need to take to rectify the problem.